Weaving patterns are used to create a variety of crafts using different mediums such as ribbon, string or cording. The ribbon fish is made by using a checkerboard pattern weave. A series of spiral and loose loops are made to pull the ribbon tail through as well as to add weaved rows. Extended ribbon tails appear fin-like and are also used to hang the ribbon ornament as room decor items such as for children's mobiles. The checkerboard weave fish can also be stitched to home decor items like pillows. Wide decorative ribbons are generally used to make large scale fishes with minimum weaving. Cut two ribbons a minimum of 20 inches in length. 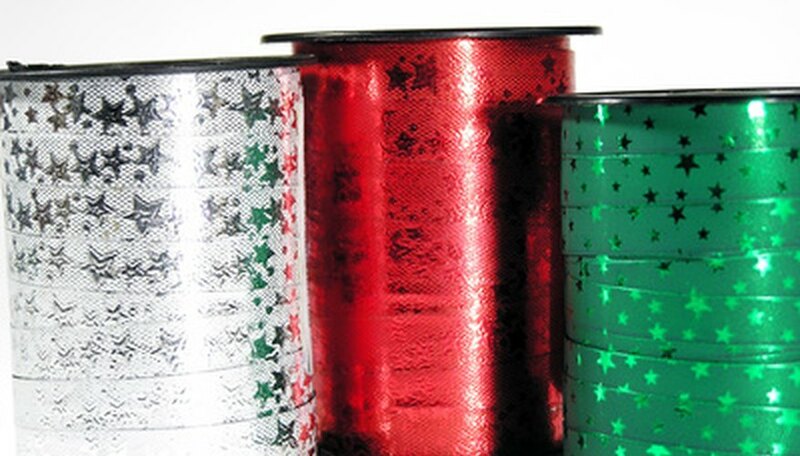 Use 1/2 to 1 inch width ribbons. Wide ribbon widths such as 2 inches, generally result in large woven fish. Fold the two ribbons in half. If you are using a 20 inch length ribbon, the folded length is 10 inches. Insert one ribbon into the second ribbon at the fold line. The ribbon appears like a “V” shape. Take the top ribbon layer facing your left and flip it down. Hold the “V” point to avoid the ribbon from unraveling. You will have two ribbons facing your left. Take the back ribbon layer facing your right and insert it around the top red ribbon. It will form a spiral shape around the ribbon. Make sure the spiral forms a minimum of two loops. You can not weave the ribbon without the loops to form the fish. Take the top layer left ribbon and insert it through the two spiral loops. Pull it gently down through the loops. Make sure the ribbon extends through the loop and has a tail. Pull the same ribbon tail through the back part of the spiral loops. Continue pulling the ribbon until the weave tightens. A checkerboard pattern begins to reveal the weave. Rotate the weaving pattern slightly until the ribbons are angled and facing your right side. Take the bottom ribbon layer and form a loop at the bottom of the checkerboard pattern. Weave the extended tail by pulling it gently through the loose loop. The loop adds another row to the checkerboard weave. Take the top ribbon layer to form a loop as in step 7. The extended tail is pulled through the loose loop as well. Another checkerboard row is added to the weaving pattern. Continue to weave the extended tails by forming loops and pulling the ribbon through the loops until the checkerboard weave pattern fish body is your desired size. Leave two tails at the top and bottom of the fish for a fin-like appearance or to hang for room decoration. Another alternative is to add adhesive at the loose loops to avoid the checkerboard weave from unraveling.